Tanker «Pskov» on 9th August sailed out of the Gulf of Ob with about 170,000 tons of liquified natural gas on board. The historic shipment started in Sabetta, the seaport and terminal on the Yamal Peninsula, where LNG was loaded from Novatek’s second train of the Yamal LNG project. Plant workers had pushed the button on the 12th of July. Natural gas started to pour into the pipes of the new plant and 8,5 days later it had turned liquified. By 9th August, about 250,000 tons had been produced, more than enough to fill up a LNG carrier. The new plant was launched more than half a year ahead of schedule. It enables Novatek, the project operator, to double its Yamal LNG output from 5,5 million tons to 11 million tons per year. 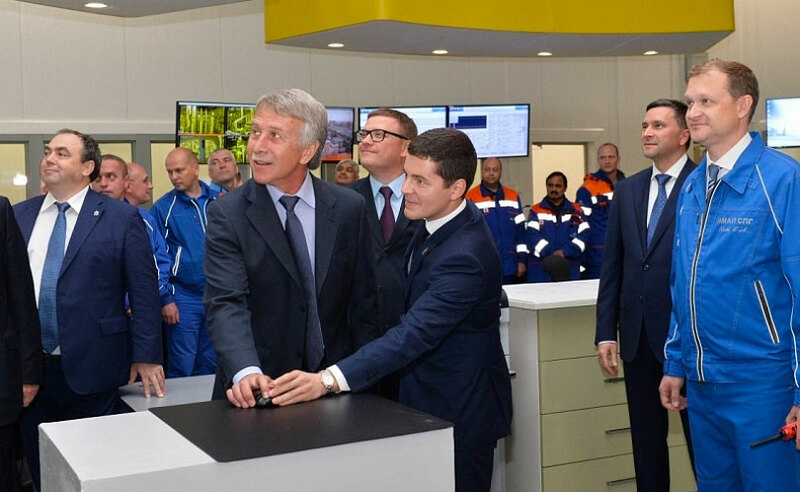 The opening of the new plant - the second of a total of three - comes less than eight months after Novatek opened the first train. Since President Putin on 8th December 2017 came to attend the grand opening ceremony, Novatek and partners have produced 3,5 million tons of liquified natural gas on site. A total of 47 shipments have been made from the project terminal of Sabetta, several of them eastwards along the Northern Sea Route to asian buyers. With the two plants in operation, the Yamal LNG will have a 3,5 percent share of the global LNG market. And far more is to come. According to company CEO Leonid Mikhelson, Novatek will by year 2030 produce up to 60 million tons of liquified natural gas, all of it from Arctic projects. The company is already with full steam developing its next projects, the Arctic LNG 2 and the Arctic LNG 3. «The project is developed within the frames of the initial budget and with a significant time advance,» Mikhelson says in a statement. Also Yamal LNG’s third train will be launched ahead of schedules, he makes clear. «The experiences made from the first part of the project now enable us to speed up developments,» project General Director Yevgeny Kot explains in a press release. The two men are praised by the federal government. In a ceremony prior to the official opening of the second Yamal plant, federal Minister of Natural Resources Dmitry Kobylkin awarded Yevgeny Kot the medal For Service to the Fatherland, while Leonid Mikhelson got a medal for «Protection of the Arctic». «Another act of bravery has been made in Yamal, I can imagine how tough it must have been to launch the second train of the plant ahead of schedule,» Kobylklin said as he handed over the awards. «These are the kind of projects that give us a leap forward in our economy, about which the President has spoken,» the minister underlined. LNG carrier «Pskov» turned westwards as it exited the shallow waters of the Ob Bay. It was the first voyage to Sabetta for the tanker owned and operated by Russian shipping company Sovcomflot. But it will far from be the last. The ship, originally built in 2014 for Gazprom, has been chartered by Yamal LNG for out-shipments from Sabetta. It is one of several tankers which over the next years will shuttle to and from the Arctic port. Novatek and its partners have hectically been chartering more ships for its quickly expanding operations in Yamal. Five carriers exclusively built for the project are already busy delivering LNG from Yamal to the markets, and another ten ships of the class will be delivered by the Hyundai Heavy Industries. In addition comes the «Clean Planet» and «Clean Ocean», two carriers recently leased by Dynagas. According to newspaper Vedomosti, Yamal LNG has also entered into a deal with Dynagas over the vessels «Yenisey River» and «Lena River». It is foreign shipping companies that carry the LNG from Yamal to the markets. Only one of the 15 Arc7-class tankers built in South Korea will carry a Russian flag. The remaining ships will be operated by companies Teekay, China LNG Shipping, MOL, Dynagas and Sinotrans Shipping Ltd.